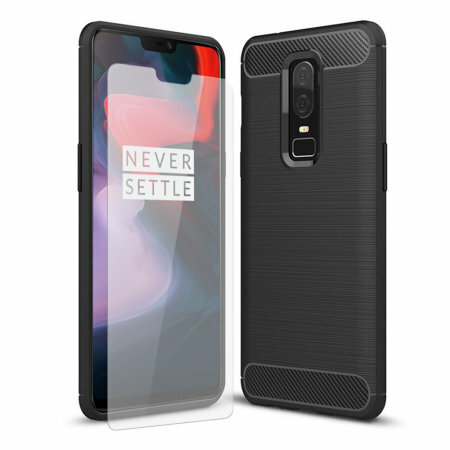 Flexible rugged casing with a premium matte finish non-slip carbon fibre and brushed metal design, the Olixar Sentinel case in black keeps your OnePlus 6 protected from 360 degrees with the added bonus of a tempered glass screen protector. Great case, fits perfectly and looks good. Grips really well in the hand. Be aware that some headphones may not fit through the hole as one of mine didn't. The case fits the phone perfectly and raises the camera and screen to stop it from touching the surface but the stock image slightly differs from the real thing, the cut out for the camera is much wider but still feels good and doesn't slip. The screen protector is bad. The only thing keeping it attached is two thin strips of adhesive down each side which have already slipped around and i can see the horizontal lines. It doesn't resist fingerprints at all and gets dirty easily. Ended up buying a different one somewhere else. I should've bought a different design that I preferred without the protector and saved myself some money. The outer case fits well. The tempered glass is a lot better than some of the cheaper ones, and doesn't lift at the edges. Only minor complaint is that there is a very slight gap between the edge of the screen protector and the case. Not as snug a fit as the Otterbox was on my last phone. Not dropped it yet so can't advise whether it bounces or not!